Blade is 8-1/2″ long, so overall 13-1/2″ long. Forged from a piece of 1075 steel that started out as 10″ x 1/4″ x 2″. A belt clip was added to the kydex sheath after the picture was taken. I form all the sheaths myself. 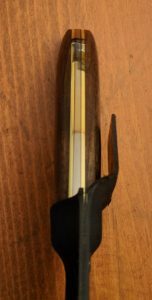 Handle is black walnut with brass added between the tang and wood. Handle was simply buffed with red compound (or rouge) to obtain the finish you see. Buffing/polishing the brass (after using high grit belts on it) produced the shine you see above. With this blade I’ve started putting the complete edge on using the belt sander. Using progressively finer grit belts, starting at either 100 or 120 grit and progressing to either 800 or 1000 grit for the final edge. Then a little time on the buffing wheel to strop the edge to get it to be razor sharp.